“Perfumer, your name is nobody”, Yuri Gutsatz (founder of Le Jardin Retrouvé) once famously said. 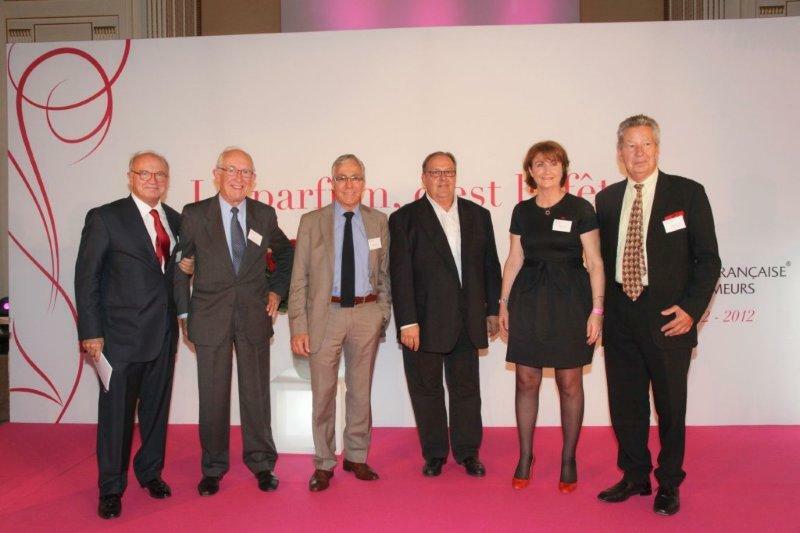 Today, as the Société Française des Parfumeurs – the largest such organization in the world, with over 700 paid-up members – celebrates its 70th anniversary, noses are no longer hidden in their labs. Following the double lead of Frédéric Malle, the first to put their names on labels, and of the online perfume culture, which devised its politique des auteurs by singling out perfumers with strong signatures, the industry now shoves perfumers in the spotlight to promote its products, and their presence in the media has never been more prominent. 1/ There is no official perfumer’s diploma: the training dispensed by ISIPCA is in “formulation and evaluation”. 2/ Though perfumery requires just as much training and competence as law or medicine, there is no professional order recognizing the legitimacy of professionals. 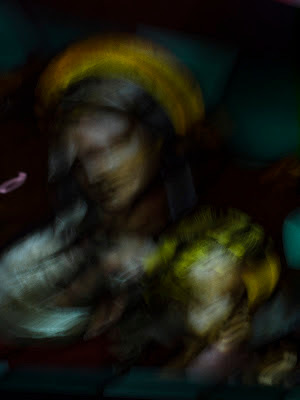 3/ As a result, just about anybody and his sister can become self-proclaimed perfumers, or even “master perfumers” (an honorific title bestowed in certain companies to their most senior noses). Thus, the owners of many niche brands can pretend to be the authors of the products they sell. A gray area at best, since in some brands, the owner/artistic director genuinely collaborates with one or several perfumers to express an original vision, while in others, they just buy juices off the shelf in composition houses and pretend they've done the job themselves. 4/ Courts of law don’t acknowledge perfume formulas as “intellectual work” but simply as the application of know-how, which prevents the legal protection of formulas, and leaves perfumers (or creative teams) bereft of anything even approaching the status of artists, authors, composers or software developers. 5/ The profession has never truly united to defend its palette against the onslaught of regulators – IFRA isn’t necessarily the biggest bogeyman here: it is the EU regulations that have force of law. And noises say they’re about to get very nasty indeed. For all of these reasons, the SFP has put together a new body, the Cercle International des parfumeurs-créateurs [International Circle of Perfumer-Creators], whose founding members are Raymond Chailland and Maurice Maurin (both former presidents of the SFP), Patricia de Nicolaï (president of the Osmothèque), François Robert (son of Guy Robert, Quintessence Fragrances), Dominique Ropion (IFF), Maurice Roucel (Symrise), Christopher Sheldrake (Chanel) and Thierry Wasser (Guerlain). 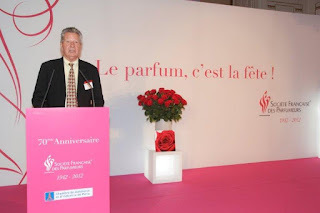 Its foundation was announced by the perfumer Raymond Chaillan in a speech co-authored with Maurice Maurin, at the SFP’s 70th anniversary celebration on September 27th in Paris. Here is my verbatim translation of the speech. The first statutes of the perfumers of Grasse were registered in 1724. The guarantors were the syndics and deputies elected by the town’s general assembly. To belong to the corporation of syndics, at least ten years of apprenticeship were required. The aspirant was questioned by at least four masters who ordered the execution of a masterpiece. Grasse industrialists perpetuated this practice, at least in spirit, up to the globalization of perfumery and the emergence of international companies producing raw materials, then compositions. In Grasse, there were 50 factories in 1850, 30 in 1940. There are less than 5 today. This glimpse into the past demonstrates, if need be, that the perfumer’s trade requires lengthy training. Are we ever done discovering its mysteries? It also shows us that if the presentation of a masterpiece was required, it was because this trade and those who practiced it were highly regarded, without necessarily calling it ART. The production companies were responsible for training and recognition. Physicians, lawyers, architects, craftsmen are members of an order or organization which acknowledges their legitimacy. We, perfumers, are nowhere. And perfumes are not considered “intellectual work”, but at most, the result of know-how! This is what we’re told. We have studied the possibility of founding an Order. Too long, too complicated, a bit pompous and too risky. 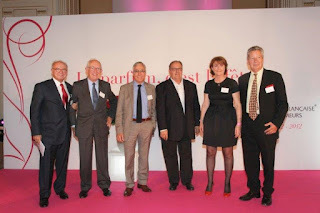 The founding members – Raymond Chaillan (excuse me for the alphabetical order), Maurice Maurin, Patricia de Nicolaï, François Robert, Dominique Ropion, Maurice Roucel, Christopher Sheldrake, Thierry Wasser – decided on CERCLE INTERNATIONAL DES PARFUMEURS-CREATEURS [International Circle of Perfumer-Creators] with a slight regret we couldn’t use “perfume composer” which was harder to protect legally. To reach this stage, we sent an email to all the perfumers who were members of the SFP [French Society of Perfumers] to ask them their opinion on the project. 80% replied, and 100% of the responses were positive and often enthusiastic. On the strength of this legitimacy, of this foundation, we were able to go forward in our reflection and to set up a Comité des Sages [Wise Persons Committee]. There was nothing occult, secret or hidden at any point. No cronyism! Don’t worry, no one will be forgotten! Our next meeting is at the end of October. This Comité des Sages brings together 29 perfumers, men and women, as well as our President Patrick Saint Yves. In our choices – we had to proceed by co-optation – we were careful to be as equitable as possible, both geographically and in the various specialties of our trade. We don’t distinguish between perfumers on the deck and other in the hold of the ship! We need passion and very hot water to run our mill! Needless to say, this event greatly boosted our project even as newspapers, weekly magazines, the Cité des Sciences, the CNRS, the Sorbonne, the INRA are speaking of perfume and its philosophy, olfaction and its mechanisms… There is a sudden and incredible interest for the rehabilitated sense of smell. And therefore, for perfumers and their peculiar trade. So? Why not stay put since everything is going so well? If those who make niche perfumery, which is a significant part of our business because of the quality and research it puts into its products, just settled for being publishers, why not? Creativity would stay in its rightful place. But this isn’t the case: they shamelessly appropriate the creation of perfumes they buy from specialized companies. Defining and defending this difficult trade, bringing together all the genuine perfumer-creators, ensuring links with teaching centers, collaborating with the Osmothèque, institutions, IFRA, the European Commission, the press, saying it is no longer possible to reduce again and again our palette of naturals, that creativity is being jeopardized, that it is reaching its limits, that all the indicators are red, and that entire swathes of our French heritage are threatened to crumble, to disappear: these could be the essential functions of our Circle. It is within this framework, under the aegis of the SFP and its president, that the Comité des Sages was brought together. The Circle will be a body of the SFP. Its legal status has yet to be established. I have tried to be brief. But some things need to be said. We don’t always have such a quality audience! Our fondest wish of course is that our new Minister of Culture will understand and support our endeavor, that industry leaders too will understand that our sole ambition is to defend our trade. We want them to understand the force we represent, the place we occupy by our unique know-how. We stand against the insidious appearance of a spontaneous generation of opportunists masquerading as perfumers, who set up as Noses in two clicks on the internet, despite being total strangers to normal channels, appropriating a recognition they don’t deserve, offering hazardous blends to unsuspecting consumers, usurping the title of perfumer, to which we want to give a meaning. We must reconquer our Art of composition, of writing, with the understanding, assent and support of the whole industry, from producers to brands. To manage and prepare the future. In time, things will find their rightful order. « Parfumeur, ton nom est personne », proclamait jadis Yuri Gutsatz (fondateur du Jardin Retrouvé). Aujourd’hui, alors que la Société Française des Parfumeurs – la plus importante organisation du genre au monde, qui compte plus de 700 membres – vient de célébrer son 70ème anniversaire, les nez ne sont plus planqués dans leurs labos. Sous la double impulsion de quelqu’un comme Frédéric Malle, qui le premier a inscrit le nom des auteurs de ses parfums sur les flacons, et de la culture parfum en ligne, qui a mis en avant une version olfactive de la politique des auteurs en repérant les parfumeurs à forte signature, l’industrie ne se prive guère de pousser les nez sous les spots pour faire de la promo, et leur présence médiatique n’a jamais été aussi forte. 1/ Aucun diplôme officiel de parfumeur n’existe, celui dispensé par l’ISIPCA étant en « formulation et évaluation ». 2/ Bien que l’apprentissage de la profession soit aussi ardu et long, et que son exercice requiert des compétences aussi élevées que, par exemple, la médecine ou le droit, aucun ordre professionnel n’existe pour la valider. 3/ Du coup, tout le monde et sa sœur peut s’autoproclamer parfumeur, voire « maître parfumeur » (il s’agit là d’un titre essentiellement honorifique conféré dans certaines sociétés de composition). C’est ainsi que certains propriétaires de marques de niche peuvent se prétendre les auteurs des produits qu’ils commercialisent. Dans des cas que l’on espère nombreux, il existe une réelle collaboration créative entre le propriétaire ou directeur artistique et le ou les parfumeurs. Mais plus souvent qu'on ne croit, les jus sont tout simplement achetés en « prêt-à-commercialiser » dans les sociétés de composition. 4/ Les formules de parfum ne sont pas reconnues en tant qu’œuvres de l’esprit, la jurisprudence les considérant comme le résultat d’un savoir-faire, ce qui d’une part empêche leur protection contre les contre-types et contrefaçons, et d’autre part prive les parfumeurs d’un statut équivalent à celui des artistes, auteurs, compositeurs ou créateurs de logiciels indépendants. On peut se gargariser du mot « art » à s’en assécher la bouche, mais lorsqu’un créateur n’a ni droits d’auteur, ni droit moral sur son œuvre, le terme reste purement symbolique. 5/ L'industrie ne s'est jamais mobilisée pour défendre sa palette contre le massacre des réglementations. L’IFRA n’est pas forcément le pire ennemi dans cette histoire : c’est au niveau européen que les réglementations ont force de loi, et les nouvelles directives pourraient causer de véritables carnages. Pour toutes ces raisons, la SFP a suscité la création du Cercle International des parfumeurs-créateurs, dont les membres fondateurs sont Raymond Chaillan et Maurice Maurin (tous deux anciens présidents de la SFP), Patricia de Nicolaï (présidente de l’Osmothèque), François Robert (fils de Guy Robert, Quintessence Fragrances), Dominique Ropion (IFF), Maurice Roucel (Symrise), Christopher Sheldrake (Chanel) et Thierry Wasser (Guerlain). Cette fondation a été annoncée par Raymond Chaillan dans un discours cosigné par Maurice Maurin au gala du 70ème anniversaire de la SFP, le 27 septembre dernier à Paris. Avec la permission de la SFP, je reproduis ici ce discours in-extenso. « Les premiers statuts des Parfumeurs grassois ont été enregistrés en 1724. Les garants en étaient des syndics et députés élus par l'assemblée générale de la ville. Pour appartenir au corps des syndics il fallait avoir au moins 10 ans d'apprentissage. L'aspirant devait se présenter devant au moins quatre maîtres qui l'interrogeaient et ordonnaient l'exécution d'un chef d'œuvre. Les industriels grassois ont perpétué cette pratique, tout au moins dans l'esprit, jusqu'à la mondialisation de la parfumerie et l'émergence des sociétés internationales de matières premières d'abord, de création ensuite. Il y avait à Grasse 50 usines en1850, 30 en 1940. Il y en a moins de 5 actuellement. Ce retour dans le passé nous montre, si cela était nécessaire, que le métier de parfumeur est long à apprendre. A-t-on jamais achevé d'en découvrir les arcanes? Il nous montre aussi que si la présentation d'un chef d'œuvre était exigée, c'était bien parce qu'on avait une haute idée de ce métier et une grande considération pour ceux qui l'exerçaient. Sans pour autant parler d'ART. Les institutions productrices se chargeaient de l'enseignement et de la reconnaissance. Les médecins, les avocats, les architectes, les artisans, sont inscrits dans un ordre ou une association qui leur confèrent une légitimité. Nous les parfumeurs ne sommes nulle part. Et les parfums ne sont pas « des œuvres de l’esprit ». Tout au plus le résultat d'un savoir faire! Voilà ce qu’on nous a dit. Nous avions étudié la possibilité de créer un Ordre. Trop long, trop compliqué, un peu pompeux et trop aléatoire. Les membres fondateurs - Raymond Chaillan (pardon pour l'ordre alphabétique), Maurice Maurin, Patricia de Nicolaï, François Robert, Dominique Ropion, Maurice Roucel, Christopher Sheldrake, Thierry Wasser - sont arrivés au choix du CERCLE INTERNATIONAL DES PARFUMEURS-CREATEURS, avec un léger regret pour Compositeurs de Parfums, plus difficile à protéger au plan juridique. Pour parvenir au stade avancé où nous sommes, nous avons adressé à tous les parfumeurs de France inscrits à la SFP un mail leur demandant leur avis sur le projet. Nous avons reçu 80 % de réponses dont 100% positives et souvent enthousiastes. Forts de cette légitimité, de cette assise, nous avons pu avancer dans notre réflexion et constituer un Comité des Sages. Il n'y a jamais rien eu d'occulte, de secret, de caché. Pas une histoire entre copains ! Rassurez-vous, personne ne sera oublié ! Prochaine réunion fin octobre. Ce Comité des Sages réunit 29 parfumeurs, femmes et hommes, et notre Président Patrick Saint Yves. Notre souci dans le choix - il fallait bien coopter- a été de le rendre le plus équitable possible, à la fois géographiquement dans les Sociétés et dans les différentes spécialités de notre métier. Il n'y a pas les parfumeurs sur le pont et ceux dans la cale du bateau ! Et puis il y a eu "je t'aime un peu, beaucoup et à la folie" Nous avions besoin de passion et d'eau très chaude à notre moulin! L'assemblée constituante de ce Comité s'est tenue le 13 Juin au Ministère de la Culture. Transition inespérée! Là même où au mois de janvier le Ministre avait dans un très beau discours - avant de décorer quelques uns d'entre nous de la médaille des Arts et Lettres- appelé de ses vœux qu'à « l'instar de l'intelligence de la main soit reconnue l'intelligence du Nez comme métier d'art... Car les parfumeurs a-t-il dit sont des acteurs du patrimoine culturel français qu'il faut soutenir pour que soient assurées et pérennisées la transmission de leur savoir-faire ainsi que leur liberté de création. Qu'ils soient indépendants, rattachés à des maisons de composition ou encore à des marques de luxe, les parfumeurs ont une place à part entière dans le paysage culturel français ». Inutile de vous dire que cette première a donné une grande force à notre projet alors même que les quotidiens, les hebdomadaires, la Cité des Sciences, le CNRS, la Sorbonne, l'INRA parlent de parfum, d'odorat, sa philosophie, de l'olfaction et de ses mécanismes… Intérêt soudain et incroyable pour l'odorat réhabilité. Et du même coup pour les parfumeurs et leur singulier métier. Alors? Pourquoi puisque tout va bien ne pas rester tranquilles? Si ceux qui font la parfumerie de niche, qui occupe une place importante dans notre commerce, par la qualité de la recherche dans ses produits et leurs parfums aussi, se contentaient d'être éditeurs, pourquoi pas, la créativité resterait au bon endroit, mais ce n'est pas le cas, tous s'approprient sans honte la création des parfums qu'ils achètent aux sociétés spécialisées. Définir, défendre ce métier difficile que l'on galvaude, recueillir en son sein tous les vrais parfumeurs-créateurs, assurer les relations avec les pôles d'enseignement, collaboration avec l’Osmothèque, les institutions, Fédération, IFRA, Commission européenne, Presse, dire que ce n’est plus possible de réduire toujours et encore notre palette des Naturels, que la création est en danger, qu’elle atteint ses limites, que les voyants sont au rouge et que c’est tout un pan de notre patrimoine français qui risque de tomber, de disparaître, telles pourraient être les fonctions essentielles de notre Cercle. C'est dans le cadre, sous l'égide de la SFP et de son président qu'a été constitué le Comité des Sages. C'est au sein de la SFP que devra rester le Cercle. Il y a toujours une forme juridique à trouver. J'ai essayé d'être bref. Mais il faut bien que certaines choses soient dites. Et puis on n'a pas tous les jours un auditoire de cette qualité! Notre vœu le plus cher étant bien sûr que notre nouvelle Ministre de la Culture nous comprenne et nous aide dans notre démarche, que nos chefs d'industrie aussi comprennent bien qu'elle a comme seule ambition de défendre notre métier au sein des Sociétés qui nous emploient et pour elles et leur rayonnement, leur dire la force que nous représentons pour elles et la place que nous y occupons par notre savoir faire unique et non partagé, contre l'éclosion sournoise et la génération spontanée d'opportuns déguisés en parfumeurs qui en deux clics s'installent sur Internet comme Nez, totalement inconnus des filières normales, s'appropriant une reconnaissance qu'ils ne méritent pas, offrant des mélanges hasardeux à des consommateurs non avertis, usurpant le titre de parfumeur auquel nous aimerions tant donner un sens. Nous devons reconquérir notre Art de la composition, de l’écriture avec la compréhension, l’assentiment, l’appui de toute notre industrie dans sa totalité, depuis les producteurs jusqu’aux marques.